Mudbound is an engaging, gritty tale set in the WWII era American south. The film is based on the novel by Hillary Jordan, and at times the film still feels like we’re reading a book; this is partially because so much of the information is revealed by voiceovers reflecting the inner thoughts of the various characters. It feels more intimate and thoughtful than dramatic. Much of the character’s internal dialogue is implied in silence through subtle yet unquestionably clear body language and tension. 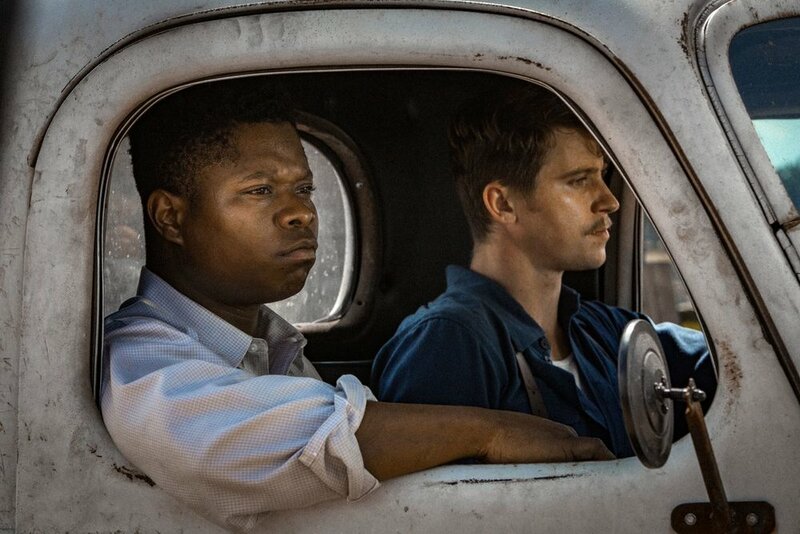 Mudbound is a story of suffering, inner turmoil and resilience on view. Laura McAllan (Carrie Mulligan) has led a comfortable upper class life in Memphis. She is well educated and cultured, and her only fear is the possibility of spinsterhood and never leaving her parents house. Therefore, she does not hesitate to respond to the attention of Henry McAllan (Jason Clarke), without really getting to know him, who seems agreeable and suitable enough to marry. In short order she has two children by Henry and he surprises her with the unexpected news that they are moving to a farm he has bought in Mississippi. Laura is neither prepared nor enthusiastic at this news, to say the least. It is the first of many disappointments which will come to define her life, not least of which is the inclusion of Henry’s obnoxious curmudgeon of a father, Pappy (Jonathan Banks), into their life. When the Henry’s farm deal falls through, they find themselves in a worker’s shack without electricity or running water on a dismal piece of land. Adding insult to injury, their circumstances are no better than their neighbors - a family of black sharecroppers. We watch Laura’s dismay as hardship, loneliness, and failure begin to seriously erode her life, her marriage, her family, and her happiness. The land is poor and unyielding, and a relationship with the Jackson family is inevitable as their struggles run parallel courses. Henry acts toward the Jackson’s with an unwarranted degree of entitlement - it is more or less the way it was in the Jim Crow south of the 1940’s. The patriarch of the Jackson clan, Hap (Rob Morgan) and his wife, Florence (Mary J. Blige) and their many children all behave with impeccable politeness and quiet dignity toward all of the subtle, and not-so-subtle, racist insults which are leveled at them on a regular basis; particularly from the loathsome racist, Pappy McAllan. When Florence comes to work for the McAllan’s as a maid she must swallow her simmering resentment. She ultimately becomes the closest thing that Laura has to a friend. Their parallels continue when Henry’s younger brother, Jamie (Garrett Hedlund) and the Jackson’s oldest son, Ronsel (Jason Mitchell) go off to war. The focus of the film shifts when the two boys return from the war. They have both served with distinction, Ronsel as the commander of the illustrious Black Panthers tank division, and Jamie as a decorated fighter pilot. And they both suffer from serious PTSD in a time when it was not widely acknowledged. Jamie comes to help Henry on the farm and Ronsel to help his family where they form an unlikely but understandable relationship based on their shared experience and sense of dislocation. Jamie takes to booze to mask his pain while Ronsel is struggling with the racism and deprivation his family is experiencing, which is such a contrast to the experience he had in Europe. The tension becomes more visceral and overt when these two return and break the silences that have been the tenor of the previous section. Wounds are opened and feelings are expressed and acted upon. The ensemble acting is uniformly terrific with a directorial style that is flawlessly naturalistic and achingly sensitive without an ounce of melodrama or sentimentality. Cinematographer Rachel Morrison films in a gorgeously color-drained palette, which elevates mud to new levels of attention. It is a richly rewarding experience. Bravo to Netflix for this thoughtful and evocative production.